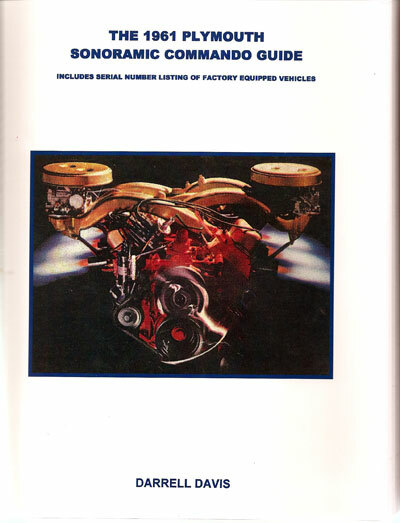 THIS BOOK IS OVER 200 PAGES AND INCLUDES DEALER AND PUBLIC INFORMATION, DEALER PRICE BULLETINS AND CODING GUIDES. IT ALSO INCLUDES A SERIAL NUMBER LISTING OF EVERY CAR EQUIPPED WITH A 383 CID SONORAMIC COMMANDO PACKAGE. AS EXTRA INFORMATION, DARRELL INCLUDED THE SAME INFORMATION ON THOSE FEW CARS EQUIPPED WITH THE 383 CID GOLDEN COMMANDO ENGINE OPTION. ALSO INCLUDED IS THE REGION AND DEALER CODE INFORMATION, THE BODY STYLE, COLOR AND TRIM AND THE OPTIONAL EQUIPMENT AND POWER EQUIPMENT INSTALLED. ACCESSORY GROUPS ARE ALSO INCLUDED.